Sit down and listen for awhile as I go over the basic story elements from the previous Witcher games and a quick synopsis of the Witcher III story. There are a lot of different elements going on, so without boring you too much - let's get started. This is a SHORT retelling and even then comes in at over 1,500 words. A lot of details are missing as this only covers main story points - feel free to add your own adventures in the comment section, but otherwise, I'm only covering main story points - the nuances are contained in hours and hours (probably well over 100 for all three games) of gameplay that I highly suggest you go and play. Geralt is a Witcher. Witchers are basically children scooped up by other Witchers and forced to undergo mutations, of which should their body accept them, are then put through a ton of terrible trials to train them for combat. This practice ended long ago, but Geralt was one of the last made and one of the best, as he had some extra mutagen power infused into him (thus the white hair). Witchers use two swords, a silver sword for monsters and a regular sword for Humans. They primarily only kill monsters, but use the human slaying sword for protection, non-monster monsters, and to kill anyone who refuses their pay. In the world of Witcher, Witchers are pretty bad, mostly because the world is constantly moving beyond non-humans and magic, and people fear a creature that can drink essentially poison to become more powerful and withstand crazy amounts of damage. So, Geralt basically is involved in a riot of humans vs. non-humans in Rivia, a hometown he gave himself when he first became a Witcher. There, a peasant named Rob spears Geralt with a pitchfork, nearly killing him, and then Yennfer, Geralt's love, falls beside him trying to heal him. Then Ciri appears and teleports them to a beautiful island, where they live recovering, until the wild hunt comes for them. They steal Yennefer and Geralt chases them, joining up with Letho and following them until their celebration. There, they discover that that they're invaders, not specters, and can easily be killed. After killing a ton of them, Geralt makes a deal to join their hunt in exchange for Yennefers life. Five years later, he awakes and is found by other Witchers who take him to Kaer Morhen. At Kaer Morhen, it's attacked by bandits, who want to steal the formulea for the mutagens. The story plays out several ways and I won't go into specifics behind the paths, but needless to say the bandits were working for the grandmaster of the Order of the Flaming Rose. Their goal is to create mutants that can withstand the upcoming prophecy that frost is going to overtake the world and mutating the citizens is the only way to continue to live. In the process of recovering the mutagens, Geralt helps King Foltest remove the curse from his daughter and King Radovid forges an alliance with Foltest (bringing the kingdoms of Termeria and Redania together as allies). 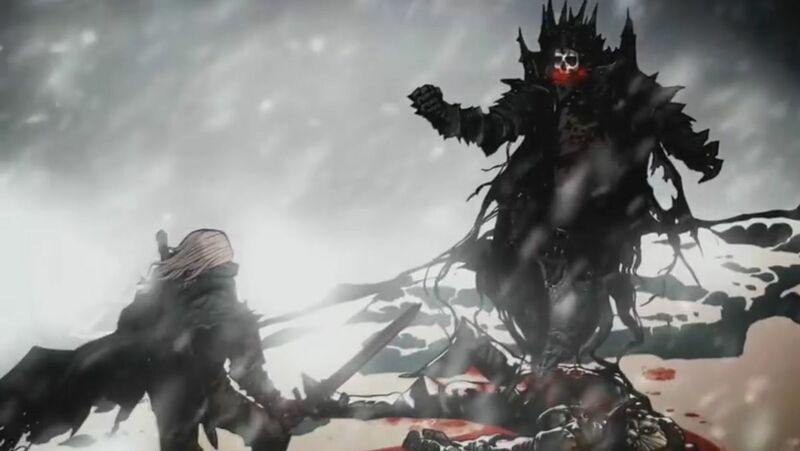 He eventually then makes his way (with the info from the king) to make it to the grandmaster who he then slays, with a choice to either surrender his soul or not to the King of the Wild Hunt (Eredin). In the end cinematic, Geralt notices an assassin and kills him, preventing the assassination of King Foltest (the assassin was a Witcher). The story of Witcher II is very hard to pinpoint, because unlike Witcher I where the choices involve helping the elves, helping the temple, or going your own way which conclude in the same ending, Witcher II has two different complete storylines. The game starts off with Foltest basically being assassinated and Geralt retelling the story to Vernon Roche, who believes him and helps him escape along with Triss. They head to a town known as Floatsam. There, his pals Dandelion and Zoltan are about to get hanged but he talks them out of the noose, then proceeds to kill a nearby beast called the Kayran. Then, he has a choice to either help Vernon Roche or Iorveth, oh and Letho (the kingslayer and dude who killed Foltest) kidnaps Triss. This moves on to chapter 2 where Geralt lands in Aedirn on one side of the battle or the other (either with the Kaedweni or the Scoia'tael (non-humans). Geralt helps lift the curse on the battlefield and does some menial tasks for each side, but he arrives at Loc Muinne where all of his choices make a final decision, if he helped Iorveth he has to choose between Triss or Philippa Eilhart, if he helped Vernon he has to choose between Triss and Anaïs La Valette. Then he has to choose if he wants to fight a dragon. At the very end, he chooses if he wants to battle Letho of Gulet or not. 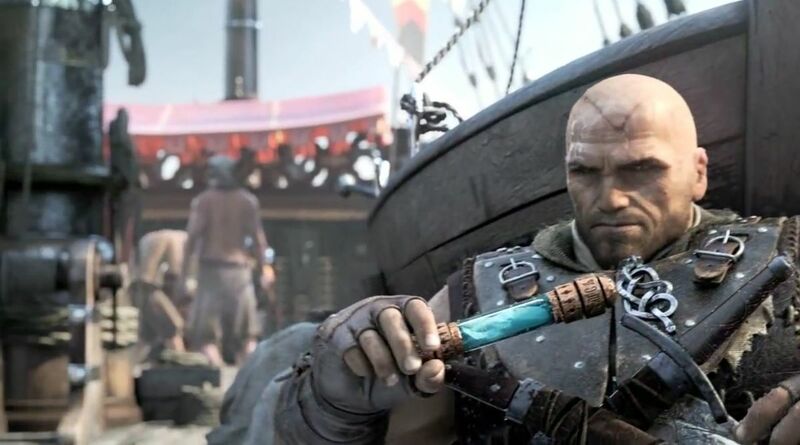 Basically, Foltest is assainated by Letho, Letho makes off with Triss, and then Geralt goes and helps either the non-humans or the humans on a battlefield, after which he goes to a giant city where he decides if he wants to fight a dragon or not and decides if he wants to kill Letho or not. In the Witcher III, the story picks up with Geralt having all of his memories back and is searching for Yennefer. He arrives at White Orchard, where he kills a Gryphon to get intel on where she's at, but she found him. She requests him to return to Vizima with her to meet the Nilfgaard King because Ciri has returned and the Wild Hunt is after her. You go to Vizima where you find out that the king, Emhyr, is ordering you to locate her and you're given three distinct leads: Velen, Novigrad, and Skellige. 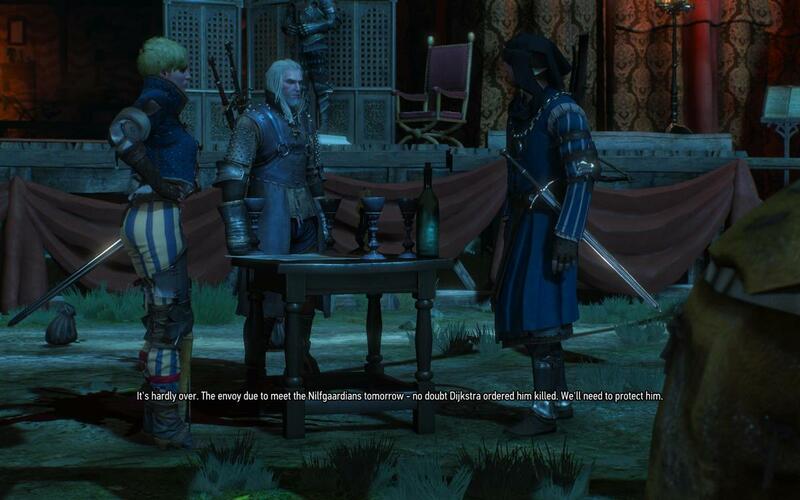 In Velen, you find out that Ciri met the bloody baron. She was first kidnapped by the crones, an evil in the forest, and then made her way to the baron, who she then fled from. Geralt assists the baron with his family issues up to and including recovering his wife, and then Geralt moves to Novigrad where he learns that Ciri has sought out Dandelion and was trying to get a phylactery uncursed, having been betrayed by Whoreson Junior and hunted by the guard (who are hunting and killing all mages). You break Dandelion out of jail and can help the mages flee persecution. The adventures then take Geralt to Skellige where the king has died and he can assist with crowning a new one (or not). Geralt finds a site of a huge magic disturbance and discovers that Ciri and an elf had fought someone there and teleported away. Going further along, Geralt finds the corpse of someone who had met Ciri (Craven) and Yennfer casts black magic to revive him long enough to tell them where she went. She had been in Skellige for a short period but fled before the Wild Hunt arrived. , like the Wild Hunt. He gives Geralt a firefly that leads him to an enchanted island where Ciri and some dwarves are at. He helps the dwarves, recovers Ciri, and brings her back to Kaer Morhen where they make their last stand against the Wild Hunt. The Wild Hunt wins the battle, but Ciri lets loose an immense amount of power which greatly wounds everyone and sends the Hunt fleeing after Vesemir is killed by Imlerith. Shortly afterwards, Geralt and Ciri move to clean up some unfinished business - Imlerith is killed, two of the three crones are killed, you find Philippa Eilhart and then, if you helped Vernon Roche earlier on, kill the King of Redonia who has gone mad and is killing mages and/or non-humans, and after everything is cleared up, you travel back to Skelliga and summon the King of the Wild Hunt for one last duel. Oh and you travel alternate worlds with Avallach too, at some point in all this. There, Geralt slays Eredin and finds that Ciri has been taken to a tower by Avallach. Once there, he finds that Ciri is going to stop the prophecy and end the threat of the white frost. If you were a good Geralt to Ciri in up to five choices, she is alive and either becomes empress or a witcher. If you were a bad Geralt then she's dead and you finish off the last crone and go and be sad. Check out our Witcher III Endings guide for a more detailed what's up with the different endings. Witcher I: Geralt has no memories, goes off with Triss to fight bandits who stole mutagens but finds out the grandmaster of essentially a cult has them and is making big brother type clones to survive a prophecy, who is killed. Witcher II: Foltest is assassinated and Geralt takes the fall. Goes on a short adventure throughout the world and has the chance to kill Letho, who was the real kingslayer. Witcher III: Geralt goes to find Yennefer, then tries to find Ciri, then defeats the Wild Hunt. That's about sums it up!